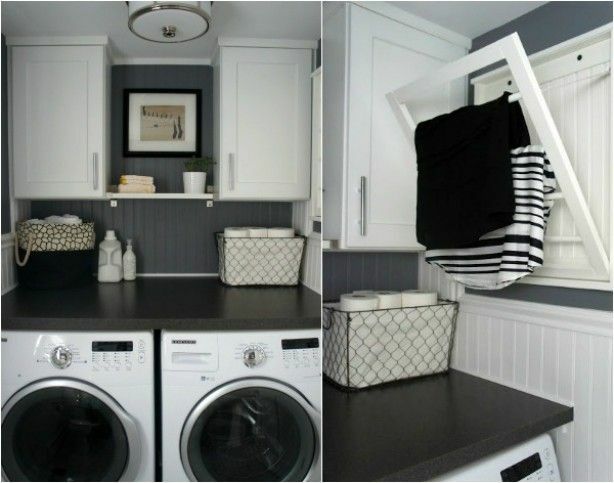 Below you’ll find 15 DIY ways to transform your small laundry room by making it more functional and a bit more stylish too. 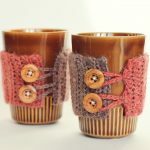 Let’s have a look and get your weekend projects started now! Home With Baxter utilized every piece of space that this laundry area had to offer. 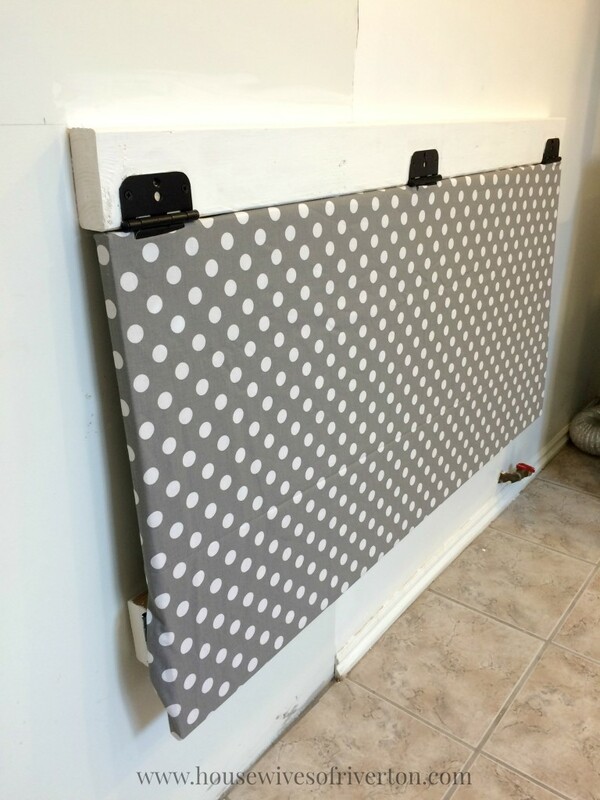 Install a tilting drying rack will leave floor room and make it easier to dry your clothes without clutter before popping them into the dryer for a nice fluff. 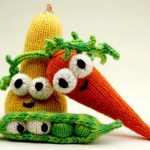 This is a pretty simple DIY to follow and there are tons of different ways to set it up depending on your specific area. 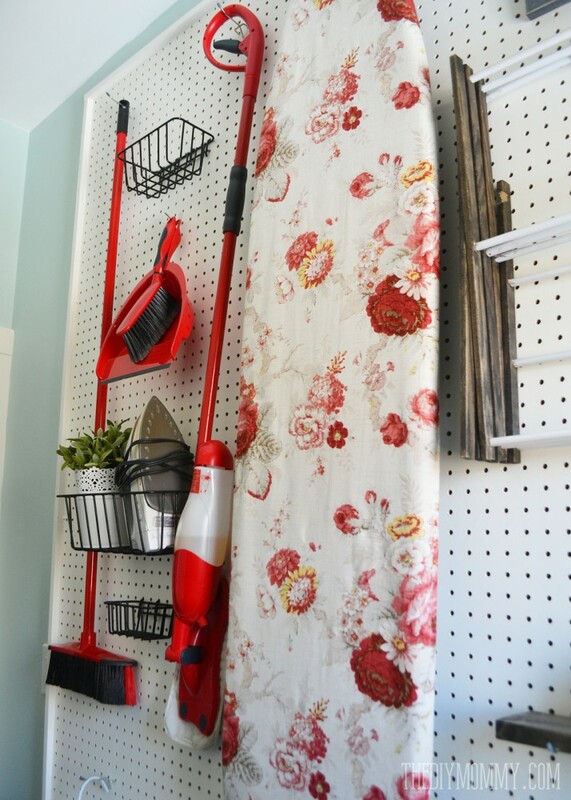 Pegboards are a super great way to stay organized in all rooms of the house, but especially a small laundry room. Check out how The DIY Mommy used hers to fix up all of the necessities she needs to get the clothes cleaned and dried. From the iron to the drying rack, there’s a place for everything. We fell hard in love with the fun idea we found while perusing Pinterest. 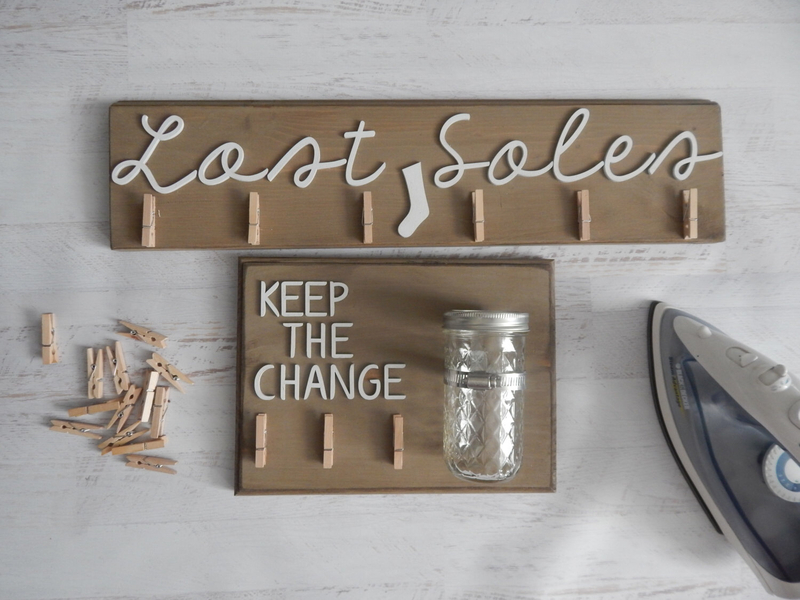 A perfect way to personalize your laundry room or closet, add a place for lost socks and coins to go. You’ll never be missing a pair again and you’ll have spare change all of the time. Hanging your board helps with the floor’s clutter issues, especially when there isn’t much space to spare. But we like the way A Diamond in the Stuff did it best. 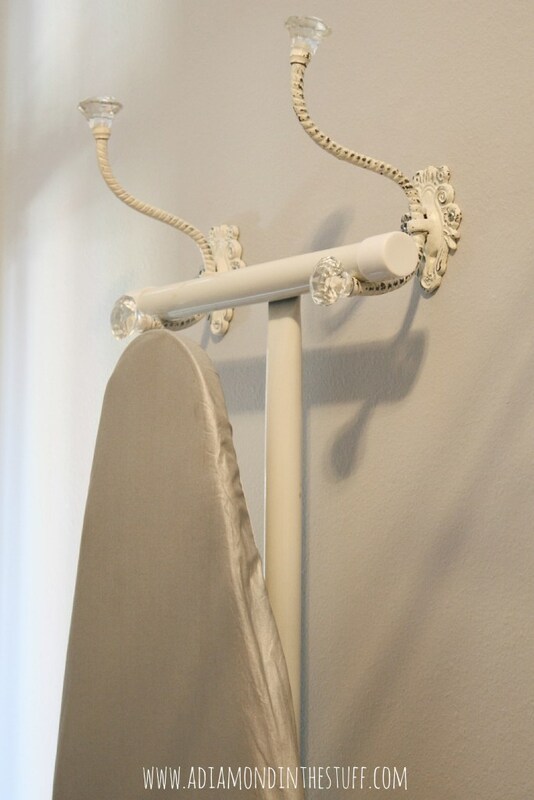 Use extra fancy hooks to not only organize but to add some style to an unsuspecting area as well. Instead of filling your shelves with big, bulky bottles of laundry soap, turn this into an opportunity to style and organize. 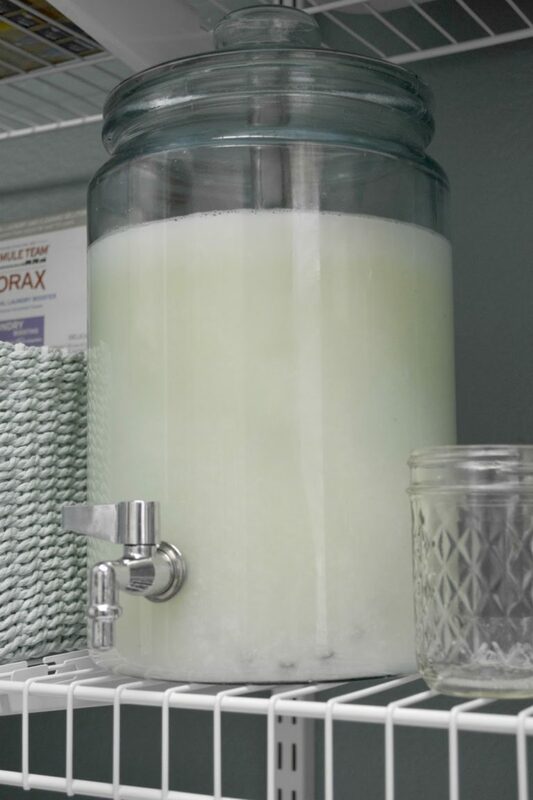 Grab a drink dispenser and pour in your detergent. Your Little Birdie has all of the details behind this great idea. 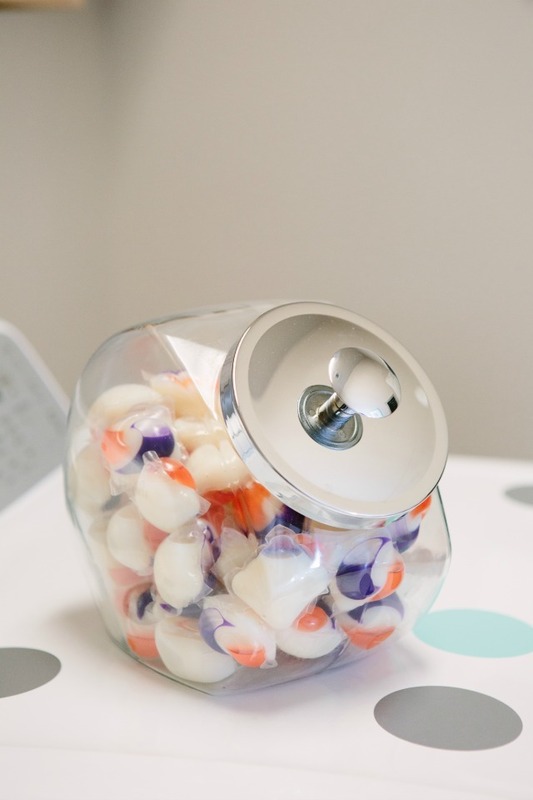 Similar to the idea above, you can do the same thing with your pods. instead of having pules of plastic bags filled with these nifty cleaning helpers, grab some canisters. We love the penny candy jars the best. 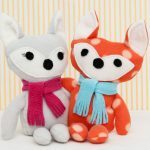 Check out all the inspiration over at Design Improvised. A great way to use extra closet space and not have piles of clothes and baskets on the floor, comes this genius way from Polkadot Chair. Name the baskets for each member of the family and then place them on the shelf. Dry clothes can go in, everyone takes their own baskets, folds and puts away in their own drawers. Voila! There’s even a way to attach a folding table – that folds – onto the wall. 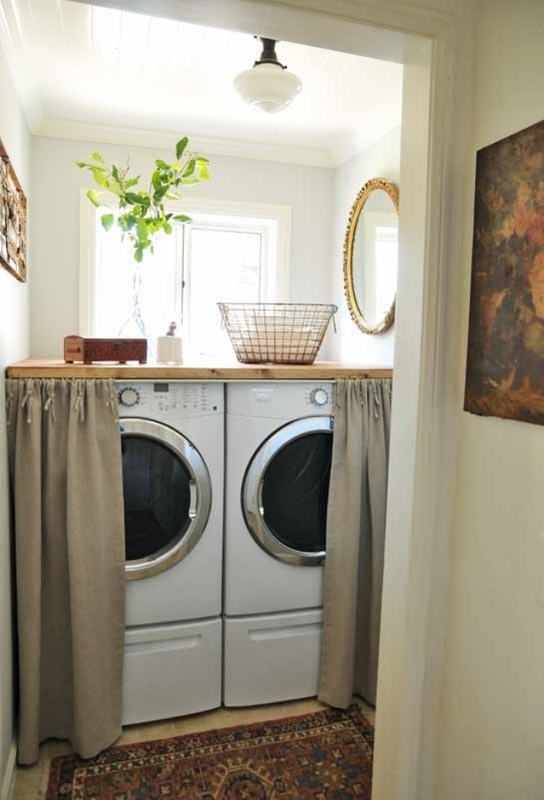 Utilize every inch, that’s the best way to go when you don’t have a large laundry room. 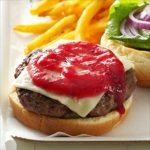 Check out how to make it happen over at Housewives of Riverton. If you’re creating a farmhouse-styled space but one that’s really organized and functional, go with this idea from HGTV. 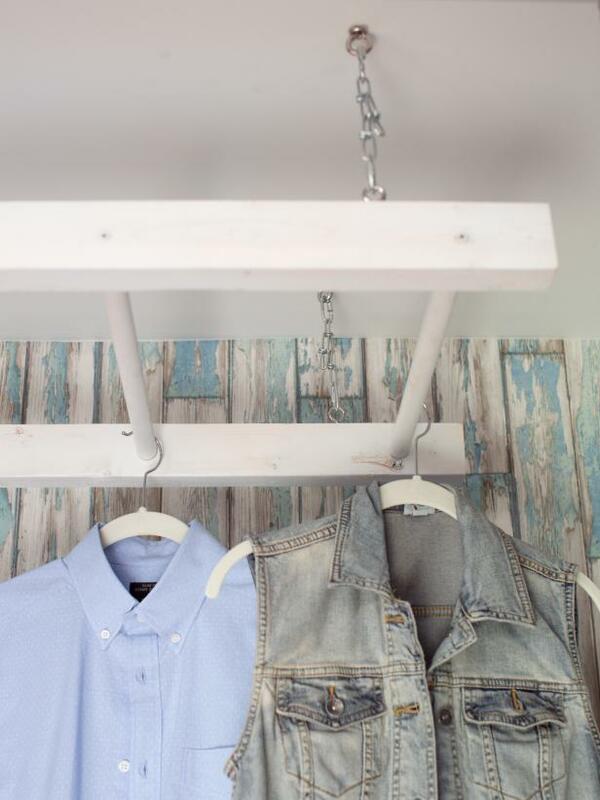 An old ladder can be repurposed into a hanging rack for your clothes! Attach it on the ceiling and get everything up and off of the floor. 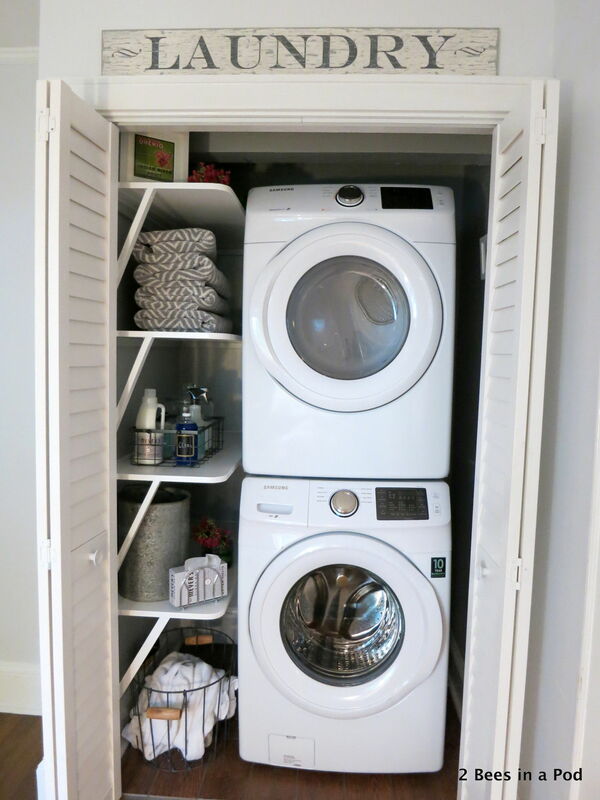 If you only have a laundry closet to work with, don’t fear, 2 Bees in a Pod is here to help you. Install some side shelves and baskets to help you organize and stay de-cluttered. 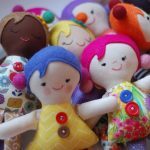 Everything you need will be at an arm’s reach and tidied too! 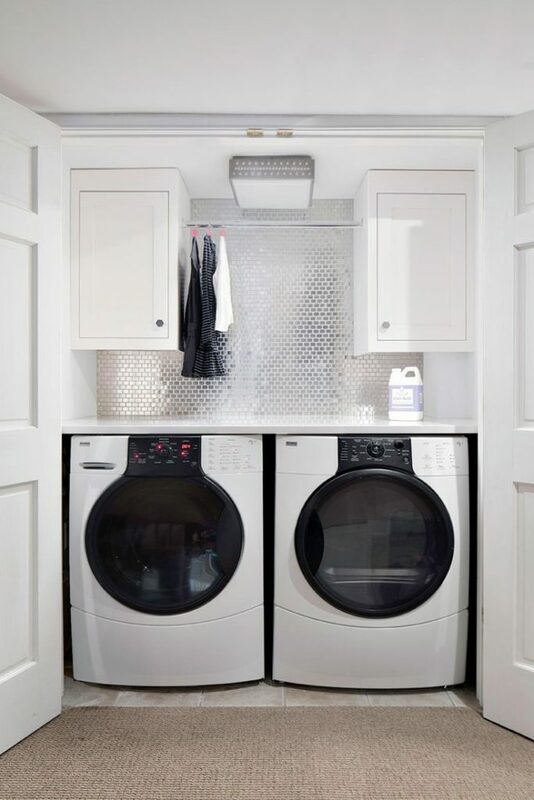 HGTV helps us out again with this chic and neat laundry closet design. If you have built in cabinets, go ahead and add a hanging rod in between them. You won’t need that extra hanging rack cluttering up the outside of the closet. Instead, everything will be stored neatly and tidily inside. Remember when we say that every inch of space needs to be utilized, that means the doors too. 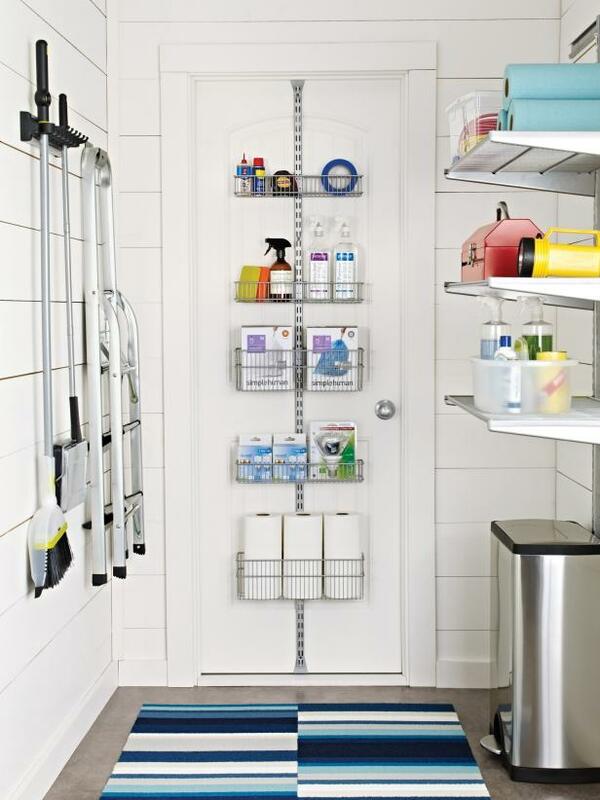 Add hooks, racks, and whatever else you can think of to help organize. Just check out this room design from HGTV. 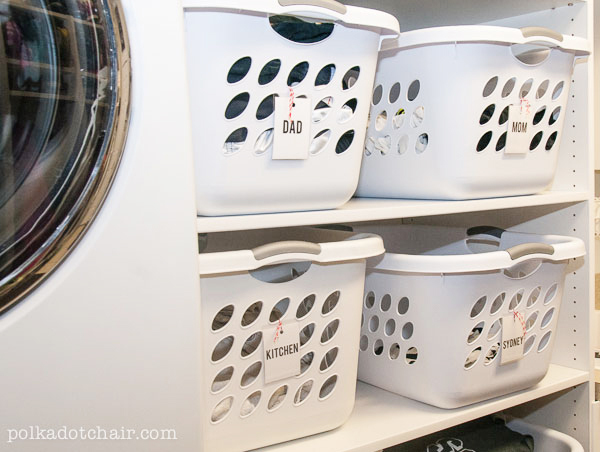 BHG had some great ideas for organizing and tidying those small laundry spaces as well. 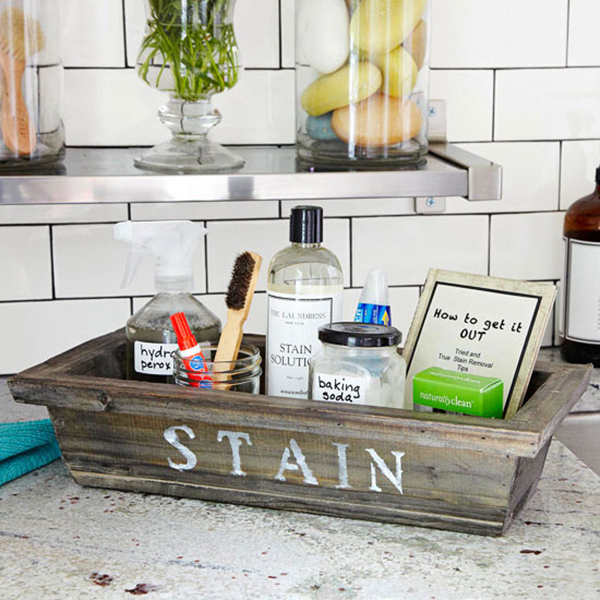 We especially loved this “stain station.” Have everything you need to get those chocolate stains and grease marks removed before anything goes into the washer. 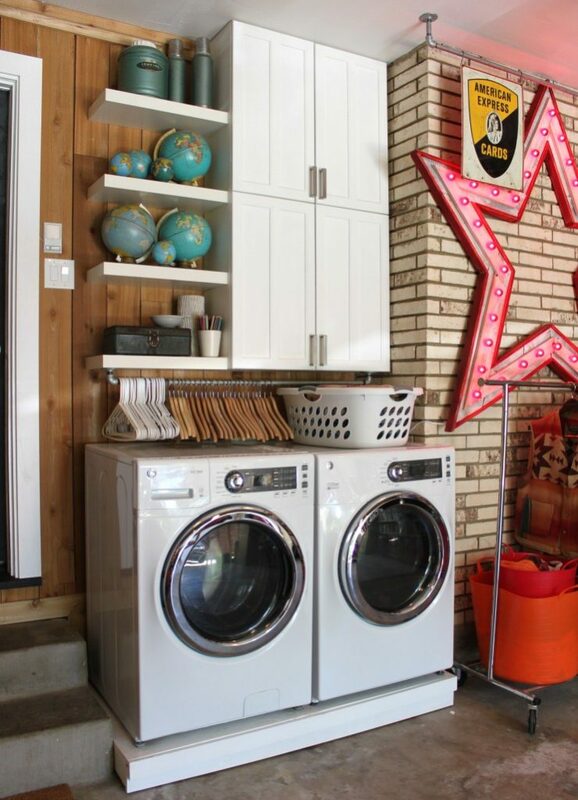 Think up when creating your laundry space. That’s what The Lavender Diary did with this one. Everything is stored, nothing is cluttered, and you don’t have to use too much space to create a functional area either. And finally, you can grab some inspiration from The Inspired Room as well. Adding a butcher block – or countertop – to the scene will help you out immensely as well. All you have to do is fold without using the extra wall or floor space.